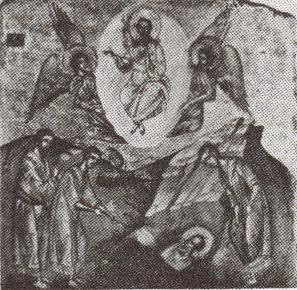 The last years of his life, the holy Apostle John spent in strict asceticism. He ate only bread and water, did not cut his hair, and dressed in simple linen garments. Because of his old age, he did not have the strength to preach the word of God even in the environs of Ephesus. At that time he taught only the bishops of the Church and inspired them to teach the people the Gospel unceasingly, and especially to keep in mind and to preach the first and principal commandment of the Gospel: the commandment of love. 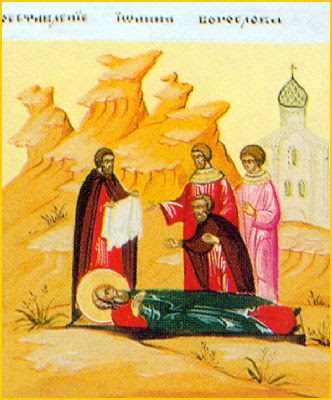 When the holy apostle became very weak, the blessed Jerome relates, his disciples carried him to the church, but he was no longer able to give long sermons. He then reduced his teaching to the unceasing repetition of "Little children, love one another." One day when his disciples asked him why he repeated this to them incessantly, John replied with the following words: "This is the Lord's commandment; and if ye keep it, it is enough." 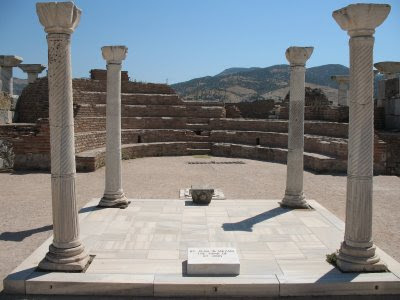 In our first visit to Ephesus, we were there for nine years, and then spent fifteen years of exile in Patmos. After twenty-six years had passed from the time we came from Patmos to Ephesus again, John came out of the house of Domnus and assembled seven of his disciples - myself and six others - and said to us: "Take spades in your hands and follow me." We then returned to the city and were asked: "Where is our teacher?" So we explained what had just occurred in great detail. They begged us that we show them the site. Therefore, we went back to the grave with the brethren, but John was not there. Only his shoes were left behind. Then we remembered the words of the Lord to the Apostle Peter: "If I will that he tarry until I come, what is that to you?" And we all glorified God, the Father, and the Son, and the Holy Spirit, to Whom is due glory, honor, and worship, unto the ages of ages. Amen. 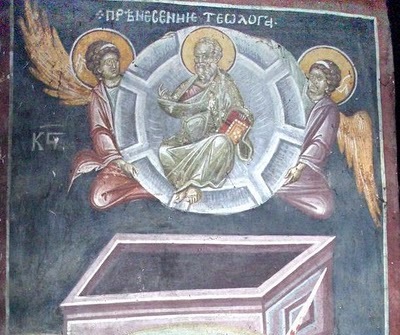 It should be noted, that according to Holy Tradition, the reason we have no physical remains but rather an empty tomb of the Apostle John is because when the disciples returned to his tomb, it was found empty. 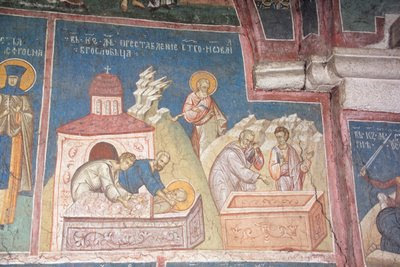 It is assumed that he was raised, just like the Lord and the Theotokos. This is what we call "Metastasis" (Translocation or Transposition), and it is what we celebrate on September 26th. 1. Taken from The Lives of the Holy Apostles by Holy Apostle Convent (pp. 149-152). 2. This last sentence is not recorded in the original, but incorporated into the text by Maximus of Margounio. Furthermore, according to St. Jerome, the Apostle John reposed in the third year of the reign of Trajan, that is 101 AD. This is sixty-eight years after the Passion and Resurrection of the Lord. This is confirmed by Clement of Alexandria, Irenaeus, and other Holy Fathers of the Church. It is believed he was about 6-8 years younger than the Lord, which made him 93 or 95 years of age upon his repose. Beloved Apostle of Christ our God, hasten to deliver a people without defense. He who permitted you to recline upon His bosom, accepts you on bended knee before Him. Beseech Him, O Theologian, to dispel the persistent cloud of nations, asking for us peace and great mercy.